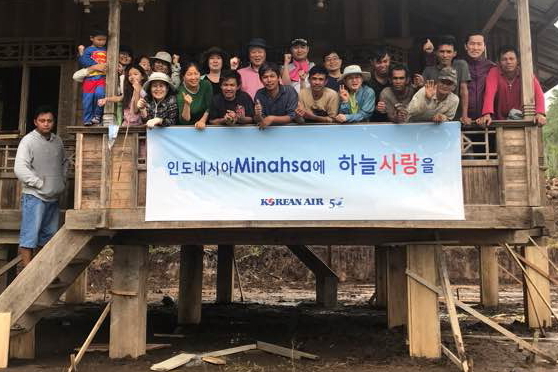 One of Korean Air’s volunteer groups were in Manado, Indonesia from 31 January to 5 February to help a local community there. Manado is the capital city of the Indonesian province of North Sulawesi, located on the island of Sulawesi, the 11th largest island in the world. The Korean Air employees visited Yettrang, an underprivileged village with a high poverty rate and no education or welfare benefits. Korean Air has a very active CSR programme in place with volunteer groups frequently contributing to underprivileged communities across the region. The Seoul-based airline currently has a total of 25 volunteer groups actively helping with projects and community programs at orphanages, rehabilitation centers for the disabled, as well as senior care centers to support disadvantaged groups. See latest HD Video Interviews, Podcasts and other news regarding: Making a Difference, Korean Air, CSR, Manado, Children.